And peace on earth to all whom God favors. 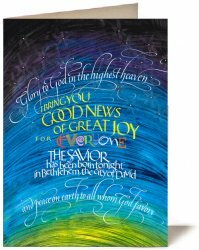 Tim Botts uses his expressive calligraphy to creatively interpret this famous greeting from the angels to the shepherds in Luke 2. Through his unique artwork Tim brings the Scripture to life celebrating the "Good News" of the birth of the baby Jesus in Bethlehem. May this announcement be a source of great joy this season and give you reason for hope in the coming year.